You know I don't know why I didn't do this one sooner. Every where you look in the comment section of blogs you will find this person's comments. The don't simply say "nice post" or "great picture" but are carefully thought out and personal. She puts her heart into her comments and believe me she leaves many. The time involved in that must be great but she is faithful and kind in the blog world. She joins many themes and memes. She showcases others blog events on her sidebar regularly. I would like to give this award to our host for Sunday Favorites every week. If you would like to give this award to anyone please feel free to take it. I just ask that you tell me so I can add their name to the list a tell them to link it back to my site so others know where to get it and what to do with it. There are no questions to answer or so many friends to pass it on to. Just give it to whomever you like and tell me so I can add their name to the list. Ohhh my gosh!!! Just read your note and of course...had to come right over to see what was up! I'm just getting going for the day...have my first cup of coffee with me...and the blogs! Hehe! Girl, what a way to start my day!!! You are just so sweet to mention me and give me the "Atta Girl" award! You have really touched my heart with your warm and generous mentions...thank you, my dear lady!!! Ohhh gosh, I think I'm blushin' here! Hehe! Well...I really do love visiting all the many great posts of the talented men and women here in Blogland! I stand in awe at the creativity and commaraderie...and always feel so blessed just to be a part! Your very kind to mention the comments that I leave...I think that I'm just "long-winded"! Hehe!...but again, thank you, my friend!!! Wow...what a way to start a day...I love it! Thank you so very much, Lori!!! You sure know how to bless a gal!!! 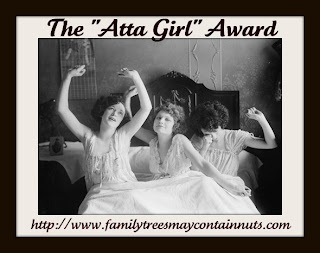 I appreciate you and I'm thrilled to receive your "Atta Girl" award!!! I can't think of anyone more deserving of recognition than Chari -- who is one of the most generous and dedicated bloggers I've "met" ... and her comments are always so kind and personal. She is a treasure, and I really enjoy participating in her Sunday Favorites; it's my chance on Saturday night to go back over my blog for my own little nostalgia trip! You sure picked a great choice. Chari is a doll and we all know she deserves this great award. Chari sound like my kind of blogger, I'm going to have to go visit her. As for your award, that is the way it should be — no strings, no added pressure to post 10 Things and pass on to 10 more. I have enough trouble keeping up as it is and that is why I have an award-free blog. Your award is just perfect, letting someone know how you feel and how much you appreciate them. Atta Girl Lori, I'd give this award to you!